I just spent two hours on my yard. Can you tell that I just spent two hours on my yard? Probably not. Though, you might be able to tell that I mowed the boulevard, if only because the grass had gotten long enough to start to sprout seed heads. But, really, now our boulevard basically looks like everyone else's boulevard, so maybe not? Sometimes I feel like I'm the only person in the world that struggles with basic yard work. Though, last night, Shawn and I took a walk around the neighborhood and I noticed that my immediate neighbors seemed to have as many bare patches and rough sections as I do. I do wonder that, given the shift in how my generation feels about going organic and chemical free, if we're going to see a lot more crappy lawns in general. We're certainly not the only people in our immediate neighborhood to plant front yard gardens. Several folks a block or so east have entirely shade/natural flower gardens for "lawns." On the other hand, it's done now and the yard looks fairly passable. At least where most people can see it. Yesterday I managed to sprain... my instep? the arch of my foot?... doing nothing more than bending down, while gardening. I'm doing R.I.C.E.(Rest. Ice. Compress. Elevate.) It hurt like CRAZY yesterday, but after a good night's sleep and a bunch of ibuprofen, I can put a decent amount of pressure on it now without feeling like I want to scream. I have no idea what I did. Twist wrong? Step down funny? Stretch? It makes me feel old. But, I'm going to keep resting it, and if I can feel the same amount better that I did between yesterday and today, I should be back to new (or old, as the case may be) in no time. This is what I get for attempting to sweep and clear out the front gardens a little. Lesson, children? Don't do any more housework than absolutely necessary. You could hurt yourself. We went to LaCrosse, as we do, over Memorial Day Weekend. My mother gave me some violets and hosta, which I quick put in the ground as soon as we got home. I think a lot of my empty spaces are finally filled out. Hopefully, my next problem (and I can already see a little bit of it in my established sections of the faux Japanese Garden) will be overcrowding. As far as I'm concerned, that's a good problem to have. I'm pleased and amazed that I managed all this without spending a penny. Everything came as gifts from friends and family! The only thing I'm going to have to buy is compost and mulch. Our trip was relaxing. Not much to report there. We had a lot of "porch time" with my folks. The only excursion we did was to a nearby prairie park. My mom had wanted to see prairie smoke in the wild and we happened to catch a bunch of it in bloom. We dropped Mason off at the airport just a little over an hour ago. He's on his way to compete in the KidWind National Competition. (https://www.kidwind.org) with his team. A lot of my friends contributed to the team's fundraiser, so A BIG THANK YOU TO EVERYONE. YOU MADE THIS POSSIBLE!! Mason will be back on Friday, and, until then, Shawn and I have the place to ourselves. I suspect we'll get up to all sorts of mischief, including maybe going hog wild and cleaning the house. Books will be read with abandon! We might even have DORITOS AND CHEESE FOR DINNER. Yesterday, it was sunny, so I spent much of the day outside. I'm really proud of how my faux Japanese garden is looking this year, and I'm working very slowly on getting other parts of the yard in decent shape. (I should really take some pictures before the ENORMOUS bleeding heart stops blooming). I don't think we'll ever be a showcase garden, but it would be nice if I could look out and feel happy instead of thinking, "OMG what a mess." I definitely think we're well on our way to that. Especially since several bulbs showed up for stuff I don't remember ordering. I planted them in a couple of different places--a few near the little free library (which is my one remaining "problem" area) and a bunch in the front of the Japanese garden. I think they're going to be irises...? We'll have to see what blooms next year, if the squirrels don't eat them all and/or replant them for me. I got a couple of letters from my international pen friends yesterday. I love all my pen friends, but I have a couple that I adore. My friend in Canada is AWESOME. Of course, I didn't get her from IPF. She's actually someone I know from Bleach fandom who volunteered last time I put out a request for pen pals. Her letters always make me happy. The other letter came from an IPF friend from the Netherlands. I like this particular woman because in her very first letter back to me she talked about her daughter and her daughter's partner (female.) This meant that I felt free to be my honest/authentic self, which is something that I've been sloooooowly revealing to my other IPFers. I mean I had that one German lady quit me because I told her I wasn't Christian. Can you imagine if I'd said that I was a big ol' lesbian? Probably we could have heard her head exploding from across the ocean, eh? But, my Netherlander is great. She got me following the recent election there--another country that held tight against the rise of fascism. She always closes her letters with "Ah! That Trump of yours!" in various iterations. A sign of our times. I kept up on my tiny bit of gardening every day goal today, at least. My neighbors at the end of the block were giving away edging rocks. I hauled all of those over to set up a title border at the top of my hill. As I think I mentioned before, the plan is to give up on trying to grow grass there and plant a deep/dappled shade garden. If I could afford it, it would be neat to do a woodland shade garden with native plants, but that might be asking too much (both of my skill set and my pocketbook). I can totally do ferns and such, though. Next step will be buying some dirt from Menards. Part of the idea of the little rock border at the top of the hill is to hopefully stop all the dirt from eroding down the hill. Otherwise, sent in an application to write for Twin Cities Geek. It's not a paying gig, but they were specifically looking for women to review comic books and since that's something I'm reading, anyway, I thought it might be fun to do it for them. I suspect I had other resolutions earlier this year, but I've forgotten them. I'm certainly not doing them, unless one of them was to try to do a little bit of gardening every decent-weather day. Yeah, so that's the thing I'm trying to do this year. I'm really hoping it will stop my gardens from becoming their usual weed-infested, overgrown disaster areas. It would be one thing if, when I let my gardens grow wild, they would become a haven for woodland creatures. Somehow that doesn't happen. Somehow I just end up with a mess. To that end, so far this year, I have spent probably a total of four hours on a couple of problem areas. One, hardly anyone will see, but we have this pathway that leads from our backyard to the front. It's usually completely ignored by me and becomes the place the weeds with the sticky burrs live. Then every time I take the garbage out and come back again, I have to pick those little sticky bastards off my sleeves. WELL. A couple of days ago, I dug that whole area out and transplanted some hostas and day lilies and now my fingers are crossed that the predicted snow does not kill them. Today I spent an hour or so on the front hill. The front hill... when we first moved into this house we had lush, green grass growing down the hillside. It was a really big pain to mow, but it was GRASS (something, it turns out, I have no skill in growing or maintaining.) Now... now there's a lot of dirt and weeds. Underneath the weeds are some hosta, so pulled out a lot of the weeds today and uncovered several hosta. A few were big enough to split and a couple were in places where they were going to get smothered out--so I moved some stuff around. I'm hoping this will help things look intentional. The second resolution is that I'm going to try to learn more conversational Japanese. I did NOT start this year out well in that regard as I have had to drop out of my community education class, however, I did find a REALLY GREAT set of language CDs at the library which I'm listening to while I do the dishes/make dinner/other housework. I love these CDs because they're actually teaching me some useful phrases ("I don't understand Japanese being the FIRST THING THEY TAUGHT ME) and they keep bringing up the things you learned in earlier lessons on heavy repeat. I actually, for once, feel like I'm retaining some of this information I'm learning. That's a HUGE step forward in the language department for me. Because I can't otherwise seem to retain information. I told Shawn that I'm going to have to buy this particular brand of language CD. Yesterday, I spent the entire day shopping for plants and planting plants. Once a year, my family and I take the trip out to Shady Acres to buy herbs and some annual vegetables. You'd think that once I planned a perennial, I'd have it again next year. The only thing I seem to be able to do that with is our parsley, which is actually a biannual. But, the parsley comes back consistently AT LEAST ONE MORE TIME. Things that should live forever, die. I think partly because I'm a crap-a$$ gardener, but also because the light of our yard is constantly changing. Things that were sunny one year, are partially-shaded the next because we have so many trees. Plus my gardening skills can be summed up thusly: dig a hole, jam the plant in, water it, and hope for the best. 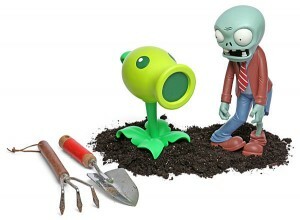 The Plants vs. Zombies lawn ornament. 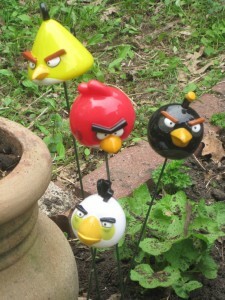 It would actually be kind of a blast to fill Mason's garden with lawn ornaments related to iPad games. Because: screw pumpkins, what I really need is plastic crap! But, so beyond the silly stuff, we bought: parsley (for more edging, though lots came back), basil, thyme (which had died, and is now in a sunnier spot), oregano (again, same), marjoram (that Shawn is going to try growing on our kitchen/pantry windowsill), eggplants, bell peppers, pumpkins and cucumbers (for the container gardens). And... I'm sure I've forgotten the other herbs we got, but we managed not to (for once) go too far overboard, I think. All the way from Indiana: A New Installment! 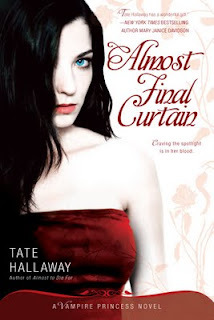 Tate's newest installment is up! I'm sorry I haven't posted in a while. I'm actually writing to you from the Blackbird Café in ValParasio, Indiana. If you go to the Wikipedia page I linked to, you'll actually see the block that the Blackbird is on. I also took a few pictures of this place to be uploaded when we get back. Particularly for my friend empty_mirrors, I also took a shot of the vastness of Illinois. She didn't ask to see it, but we were talking about the distances in the US (because it *is* rather unfathomable that we drive for ten hours and don't even really go more than a couple of states in distance.) And, so when we stopped at a rest stop, we happened to be across from a giant wind farm and there's nothing but a whole lot of empty space and the giant turbines spinning in the breeze. It was rainy and overcast, so I hope the picture really shows how desolate and empty that part of the country really feels. At any rate, we're here visiting my mother-in-law/Shawn's stepmom/Mason's grandma. Mason has this month off, so it's a good time to do our traveling. One of my favorite things about visiting grandma is that there really isn't a lot to do. I finished reading Ben Aaronovitch's RIVERS OF LONDON/MIDNIGHT RIOT and I'm looking forward to starting MOON OVER SOHO. I also brought along Bleach 60 (which our library finally had and I'm looking forward to re-reading) as well as a couple of volumes of FMA. My single LEAST favorite thing about visiting grandma is that she has no wifi. So, I have this tiny window to do ALL THE THINGS, when we sneak off to the coffee shop at 7:00 am. I feel bad about it, but it really kills two birds with one stone. Grandma is a Norwegian originally from the Iron Range of Minnesota, so her coffee is... typical of that sort of person. I won't say it's 'bad,' but I'd have to drink three hundred gallons of it to feel SEMI-human. So it's better for all of us, if we get up at the crack of dawn and hang for a couple of hours at the café. On the Saturday before we left, I had a Loft gig that I knew was going to be... "interesting" to use another Minnesotan phrase from the moment I walked in and they did the classic, "And you are...?" The library had no idea I was coming or where my event was supposed to be held, despite the fact that it was the sort of thing people had to have REGISTERED for (I was expecting three, which was never sterling, but often, with proper signage and walk-ins, you can gather a larger crowd.) But, while the Teen library blushed in deep embarrassment, I found a spot to settle and made sure that the Circulation staff (what I usually am) knew where to direct people. I got two out of the three I was expecting, but it actually turned out all right. They were two boys, a little older than Mason, who really liked the READ part of the "Reading to Write" program. So, we talked books and exchanged recommendations (most of which I passed on to Mason.) We were having such a good conversation, actually, that we ended up going over by fifteen minutes. I almost feel like that's all I need to say: "OMG. The Garden." But, I suppose it needs a little explanation. Shawn took the day off Friday and we took our semi-annual trip out to Shady Acre's Herb Farm. You wouldn't think we'd need to go so often, but I'll tell you the truth. I'm a terrible gardener. Also, the spot we originally chose to be our herb garden has gone from partly sunny to ENTIRELY shaded. So, over the next several years, Shawn and I are hoping to transform that garden into a contemplative, Japanese-style shade-garden. Given my skill level, wish us luck. Probably I'll be able to put a bench out there and grow a few attractive weeds. But, then again, that might be all we need. Anyway, after making a ginormous purchase on Friday, we spent Saturday and Sunday PLANTING ALL THE THINGS. I am sore, but content. There's only a little more to do before all the weeding and matenience starts. I just want to say a quick "hello" before going back to being head down over the keyboard. I'm trying to finish a fist draft of PRECINCT 13 this week so I can get it to beta readers and off to the publisher before we get into the "omg, so OVERDUE" part of the deadline missage. I'm at a coffee shop this morning, however, because I have to head back up the hill to collect Shawn. She's got a doctor's appointment to get a vitamin B12 shot. This is suppose to be part of the cure for theright-side numbness that she had that sent us to the hospital all those months ago. Our big plan is, if the medicine doesn't make her sick, to have a lunch date afterwards. We had a busy/not-busy weekend. We didn't have a lot on officially, but we did a lot of yardwork and we got the boxes of Halloween decorations out of the attic and STARTED putting those out/up. Halloween is one of our favorites, and I like to get creative. We built a garbage bag, leaf-stuffed spider for the front yard, and we started a scarecrow "victim" for her web. We're waiting to put up all the cobwebs until we get a new front door. We've had a broken screen door for years. Part of the reason we haven't replaced it until now is that part of the issue is the when the spring broke, it took out part of the frame. I'm only SO handy and re-building door frames is out of my pay grade. But, we're going to see if Shawn's brother has the skill set. If nothing else, we're going to purchase the new door. We have a handyman on-call if we end up needing to pay someone. That's about all the news fit to print. I had a great time on Friday going to the Occupy Minnesota demonstration at the "people's plaza" (formerly the government plaza) with Eleanor. We mostly did what Minnesotans do best -- stood around drinking coffee and chatting amiably. There was a little reading of declarations, but, generally, it was nice to be part of the movement in whatever small way I could. Because a nice woman gave me a sign that her daughter had made (the organize little fish eating the big one), a lot of people took pictures of my sign and I got interviewed by someone doing a "project" who wanted to know why I was there and what I hoped to get out of it. I said that what I'd like to see is more attention given to the middle class's' struggle by the media and politicians, and later Eleanor told me she was glad I answered that because she would have said, "REVOLUTION!" I've also been enjoying the picture that's been going around Facebook of "Octopi Wall Street" because the day that Eleanor and I were there it was Cephlapod Appreciation Day. 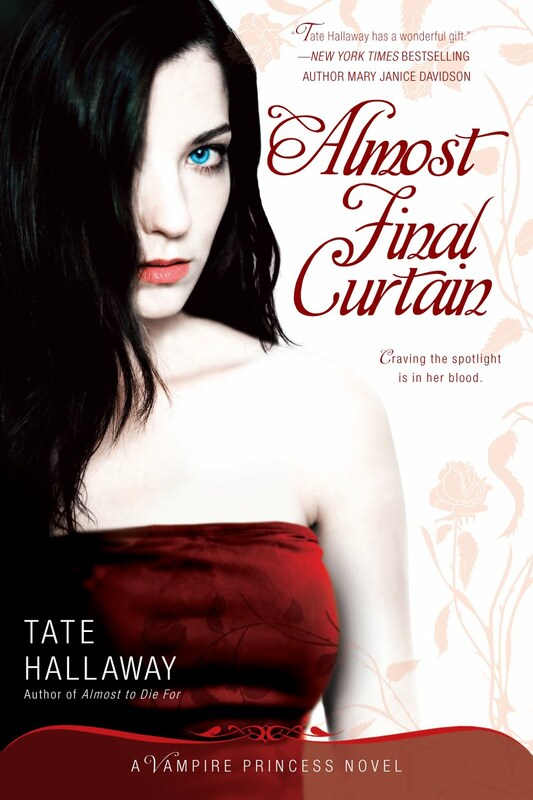 Today is the official launch date of the second book in my vampire princess of St. Paul series, ALMOST FINAL CURTAIN. In other news, Shawn and I had fun yesterday shopping for crafty (Crafty?) things at Michael's. We've been putting together a new family altar in the sunroom (which the cats have instantly adopted as a new favorite perch, so it already has good energy.) I've been having fun doing a little fabric painting on various colors of altar cloths. Plus, we bought some "modge podge" just because it's fun to say, and I was pretty sure I could find projects to do with it. When we get it all together I'll post a picture or two. The sun is finally out, so I may try to plant a few containers or expand Mason's garden EVEN MORE. We kind of went "hog wild" at Menards, so we're going to need a lot of room for all the veggies he picked out. Luckily, I'm terrible at growing grass (probably my reluctance to fertilize,) so I don't feel badly tearing up sod to make room for something more useful -- like spinach. Whole Foods actually has some blueberry plants for sale that they claim don't need acidic soil or other of the usual requirements (like male and female plants.) I'm going to look up the scientific name of what they have on offer and see how much of that is true, and if they're right that these are relatively low-maintance, I'm thinking of building a raised bed for a couple of blueberry plants. It would be COOL to have home-grown blueberries. Today started out okay, but it's quickly becoming swear worthy. I hate dial-up. I wish we could afford decent internet connection. In one way, I keep the crappy connection because, well, it's better than nothing (mostly, although I'm not sure it's doing anything good for my blood presure,) BUT it keeps me from being distracted by the shiney that is the interwebs. Not much excitement here. This weekend was pretty low key. On Saturday, Mason and I went to the downtown public library to check out their collection of Goosebumps. It wasn't much to write home about, but by chance I noticed they had BIONICLE chapter books and he started reading those. I put the last two HIKARU NO GO issues on hold... though it looks like one of them has been checked out since June. Hmmm. I've been writing steadily on Tate's young adult novel. I expect to have it done on time barring act of God/dess. Having the cover art already is surprisingly good motivation. I feel like I'd better get it done since they've already got a "package" ready. At Wyrdsmiths last Thursday, naomikritzer told me she hung out with someone at the Yeti birthday party gathering who ALSO looks nothing like me and who is often mistaken for me at cons and whatnot. This would be person number 2. The first being local author Rob Callahan, which is probably pretty embarrassing for him, as I think he's much better looking than I am... plus, well, you know, he's like a GUY. I don't mind being mistaken for a dude. In fact, some secret part of me relishes it, but no one has ever come up to me and said, "Rob, I really loved your panel! Dude, your books are awesome!!" Meanwhile, poor Rob has people call him "Lyda," which is just WRONG. Rob has always been decent about the mistaken identity when it happens, but I still feel for him. Now I find out someone ELSE is being mistaken for me? What the hey?! At least this new person being mistaken for me is female. When I asked Naomi if there were any similarities, she shrugged and said, "Well, she's a butch lesbian." Okay people, time for a newsflash: not all butch lesbians are Lyda Morehouse, and, really, take a better gander at me next time you're sure it's me you're looking at. I'm not all that _butch_. In fact, I used to wear a pin that said "butchy femme!" because that's closer to where I fall on the spectrum. I giggle way too much to be mistaken for butch, and, you know, even though I've been working out to try to be Captain America by 45, I'm still quite soft in the middle. Anyway, in other news, Mason's garden has a watermelon. Unbelievable. Have I told you about Mason's planting magic? Well, he's got it. All he seems to have to do is toss some seeds on the ground and step on them and they sprout like weeds (something my grandmother Spangler proportedly could also do.) Meanwhile, when I plant and fertilize and fret, all I get is WEEDS. How's your Monday shakin' out? I don't know if you noticed, but it's Monday. I woke up in a foul mood today, and was very snippy with my family. I'd blame the weather, but I actually like cold, rainy, dark days and God/dess knows we need the moisture. Though the weather might have a little to do with it because for the first time in a long, long time the sound of thunder woke me up last night. At first I didn't know what it was, then it rolled again and I was like, "Oh, okay, nothing fell. It's just a boom of thunder." I slept rather fitfully, and Mason called for "snugoooos" (snuggles) not long after. 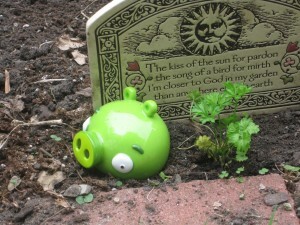 Despite the dreariness, I went outside this morning and dug up the spot for Mason's garden. I know it's late in the season, but Mason really wants to try a Victory garden this year. He's got a number of veggie seeds: corn, peas, beans, carrots and tomatoes (which I doubt we'll plant, because no one in this entire house LIKES tomatoes and it's FAR too late to expect them to grow.) And some flowers: zinnias and sunflowers. Anyway, the ground can wait for him and the weather now, as I put some garden fabric over the top to keep the weeds mostly out. My big plans for the day is to make some tea and strain the soup stock I made from the left over chicken bits from last night's impromptu feast. We'd planned to make a whole chicken, but to it I added brussel sprouts with almonds, mashed potatoes, homemade french bread, and lots of gravy. I also made a fresh cherry pie, although I have to say that apparently Betty Crocker really likes cherry pie to taste like merischino (sp?) cherries. Not my favorite, but not too bad hot from the oven with enough cool whip. Oh, and I'll be writing, too. I got the first chapter of Tate's young adult novel done, though I think it's lacking one scene, which I'm going to put in today. Then it's on to chapter two and hopefully some Mouse later today. Fingers crossed. I think some tea will help get me in the mood on this dark day. Also, Mason is off on a field trip without me (gasp!). They're going to the planetarium today. Should be fun. I can't wait to hear all about it. Another thing I've learned about myself the older I get is that the characters I used to find square and uninteresting totally turn me on now. Spock was hot. It blows my mind to think that I feel that way now, but put Spock up there with Captain America and Daredevil as a character I used to be vaguely uninteresting that now rocks my world. I'm so glad he got to say "fascinating" at least once too. In gardening news, I put a lot of plants in over the weekend, including some herbs from Shady Acres. It was a lot of work, but the yard is very slowly starting to appear more "intentional" which is my constant goal given my tendency towards overgrown, weed-friendliness. As we were coming back with some gardening supplies from Menards on Saturday, I saw a live baby bunny hopping through our underbrush. Seeing that made the whole sad day much less so. Okay, got to go work. See you all soon.